Snowdrop weekends have become ‘a thing’ over the last few years. The lure of cake (there’s almost always a tearoom) and the illusion that spring might be on the way certainly works for me. 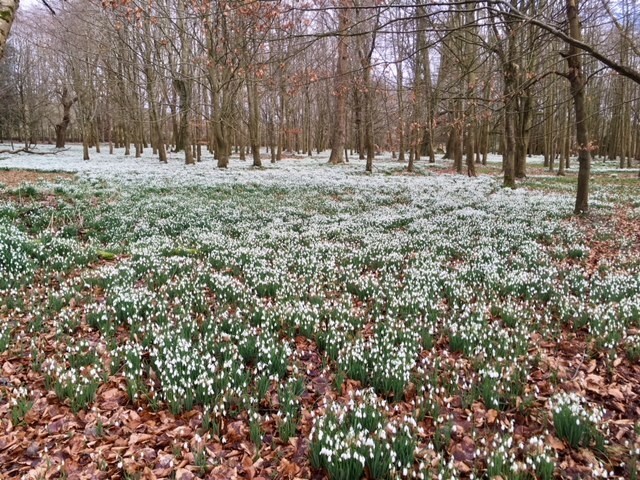 I’ve therefore rounded up my suggestions for the best places to see snowdrops in Oxfordshire and Berkshire. Actually, they’re primarily in Oxfordshire, but I couldn’t leave Welford Park out! Snowdrop weekends are generally held in mid February but this is weather dependent and they sometimes change with minimal notice. Make sure you check the individual websites for opening dates and times before you make a special journey. Pop along and walk around the snowdrops in the churchyard, enjoy cake and coffee and browse other stalls inside the church. 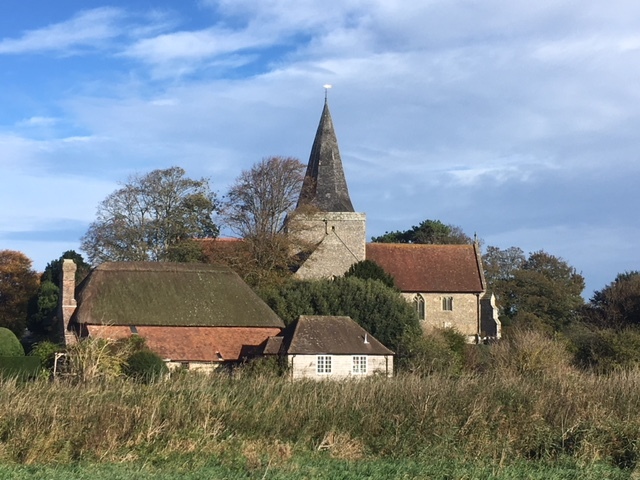 The long distance Ridgeway footpath runs past the church so you can always justify the cake by going for a walk beforehand! Read about our previous visit here. 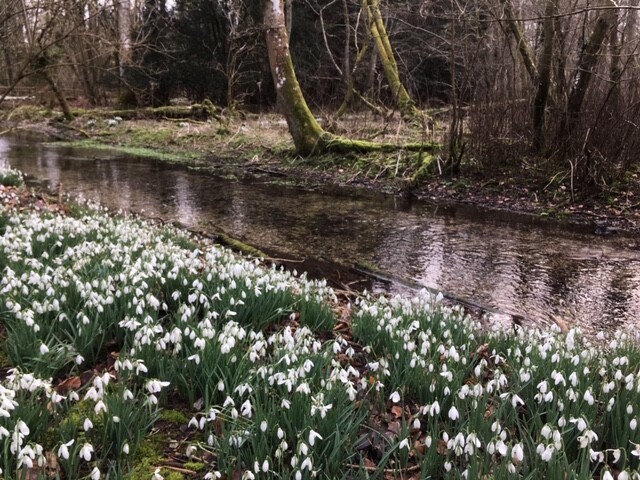 The churchyard is always open; snowdrop weekends are usually held over three February weekends; visit the church website for further details. Free entrance. A privately owned home which opens its gardens for visitors on Sundays in February. 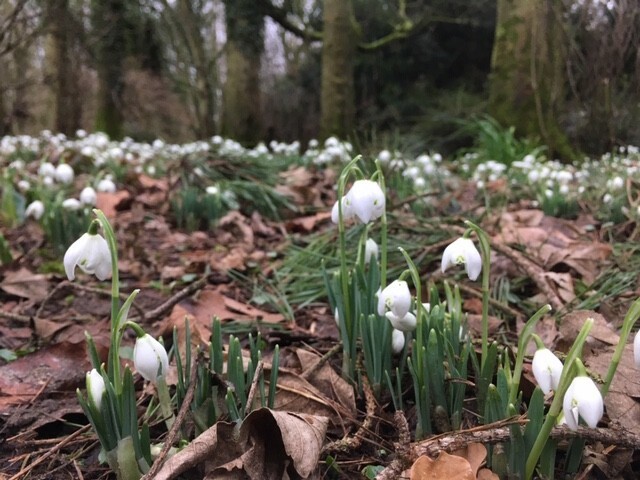 There’s more to the garden than just snowdrops; enjoy a wander around the parkland before heading to the tearoom for cake. They even have a dedicated snowdrop plant fair! Read about our previous visit to the garden here. Entrance charge applies; further details on the Kingston Bagpuize website. 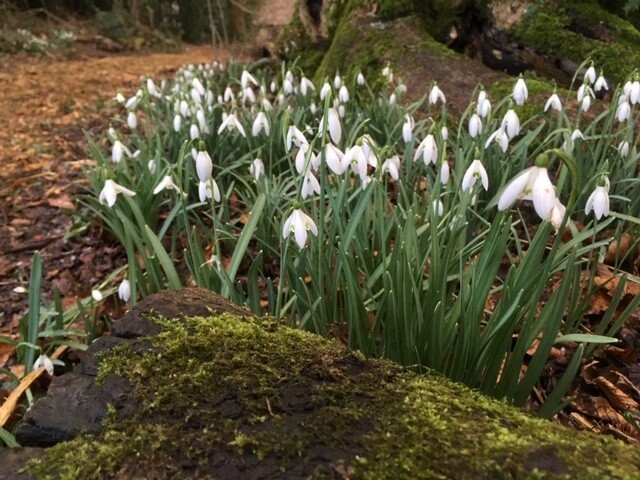 Open for snowdrop visits over just one weekend in February, the estate and house at Braziers Park are run by a community of residential volunteers. As well as snowdrop walks there’s house and estate tours, a pop up tearoom and plants for sale. Entrance fee and parking charge applies; further details on the Braziers Park website. Waterperry Gardens are open year round but run a couple of dedicated snowdrop weekends in February. 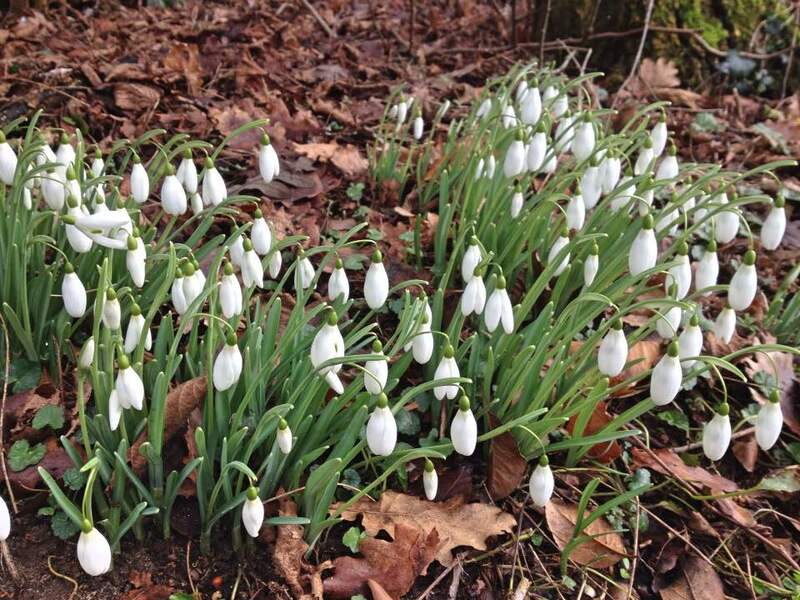 There are more than 60 varieties of snowdrops in the garden; you can join a guided tour to find out more. There’s a gift barn, tea shop and garden centre. Entrance charge applies, details on the Waterperry Gardens website. Badbury Hill is better known for its bluebells. However there are snowdrops too, albeit nowhere near as many as other sites here. Perhaps incorporate the visit as part of a longer walk rather than make a specific journey. The wood can be visited at any time. No facilities but Faringdon is close by. Free entrance. This is the granddaddy of local snowdrop displays. I think there are more snowdrops at Welford than all of the places above put together. More visitors too! 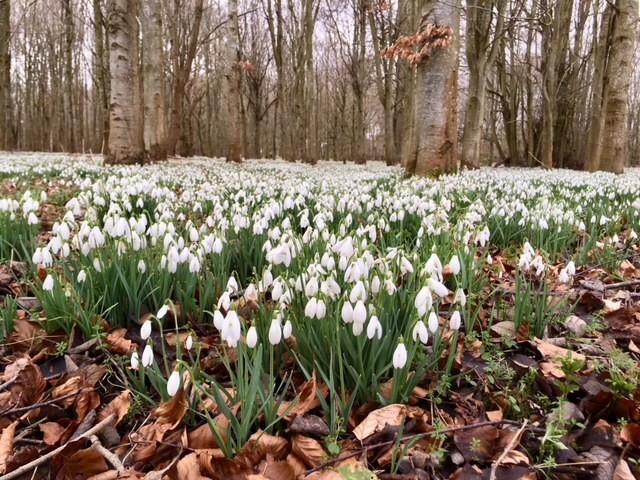 The snowdrops in the beech wood are spectacular. They are partially fenced off which is a good thing otherwise they’d be trampled by the hordes. More snowdrops, and aconites, can be found along the river bank. Look closely and you might even spot the telltale marks where the Great British Bake Off tent is erected each spring! You can read about one of our previous visits here. Open throughout February (except Mondays and Tuesdays). 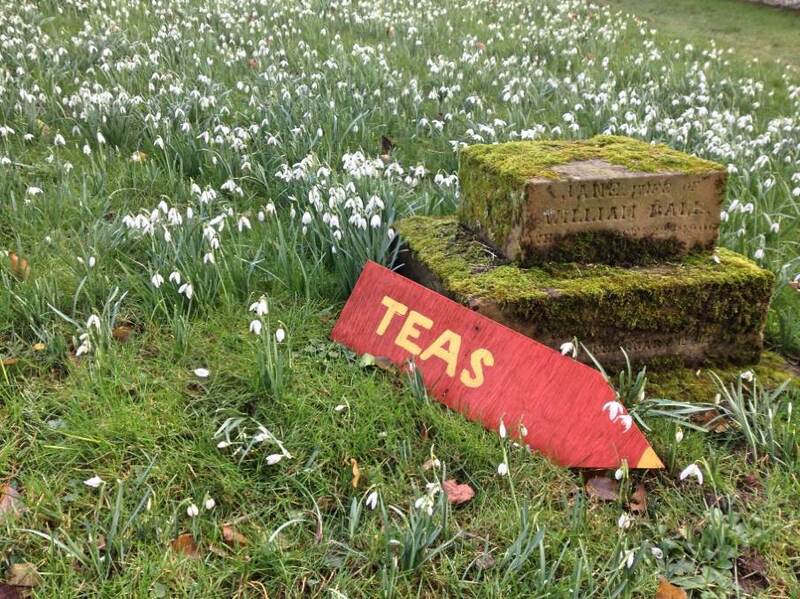 There are tearooms, a small gift shop and special snowdrop events throughout the month. Entrance charge applies; monies raised are split between local charities. Full details on the Welford Park website. Have you visited any of the above? Or do have alternative suggestions? Although I’m happy living in a town there are days when I imagine upping sticks and moving to a village. Not just any village though. It would have to be one with a thriving community, plenty of amenities and postcard pretty houses. A village like Ewelme. But I’d probably need to win the lottery first. In the meantime there’s no harm in window shopping. Checking out the houses, deciding whether the locals are friendly and monitoring the cake quality in the village cafe. 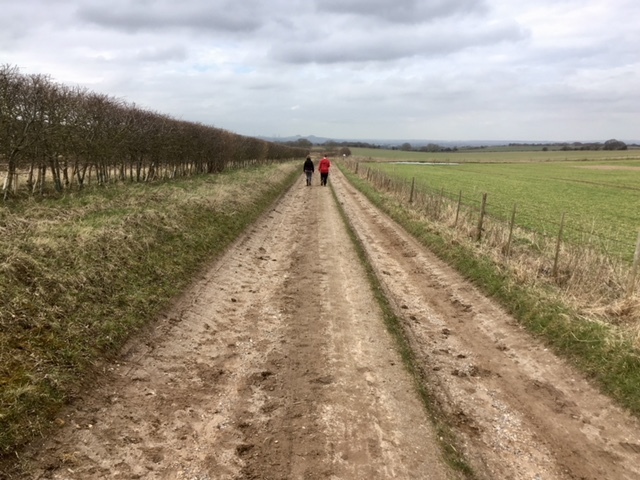 Aside from sheer nosiness we were in Ewelme to walk another route from our AA 50 Oxfordshire walks book. The four mile Ewelme Chaucer’s walk was the perfect distance for a late morning stroll, and just the thing to work up an appetite for lunch. I’d even learnt from our mistake the previous month and came equipped with an OS map, no getting lost this time! 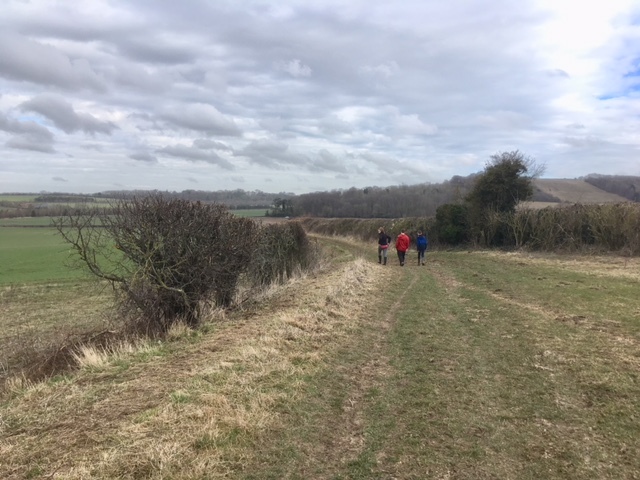 The walk started and finished in Ewelme, with a circular route that attempts to take in many of the local long distance trails. 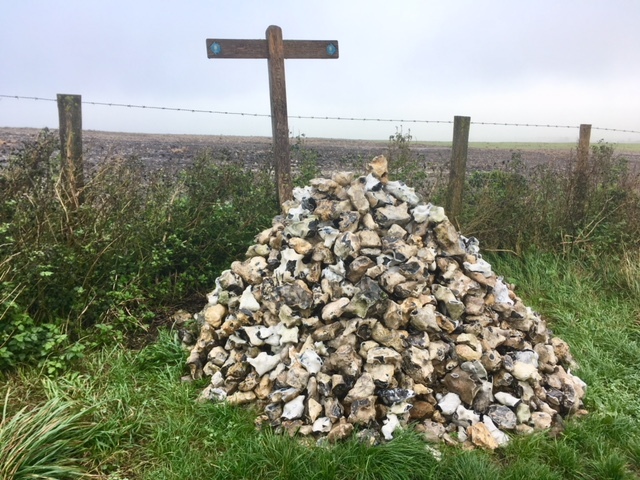 This included parts of the 65 mile Swan’s Way, the 125 mile Chiltern Way and the 110 mile Icknield Way Trail. Makes my feet ache just thinking about them. Truth be told it wasn’t the most exciting of walks. Out in the countryside everything had that late winter feel. The mud, bare trees and grey sky didn’t help. And it was cold, so very cold. There’s joy in a winter landscape but in March I want spring sunshine, lambs and blossom. Instead the star of this walk was Ewelme itself. Starting with the village store. 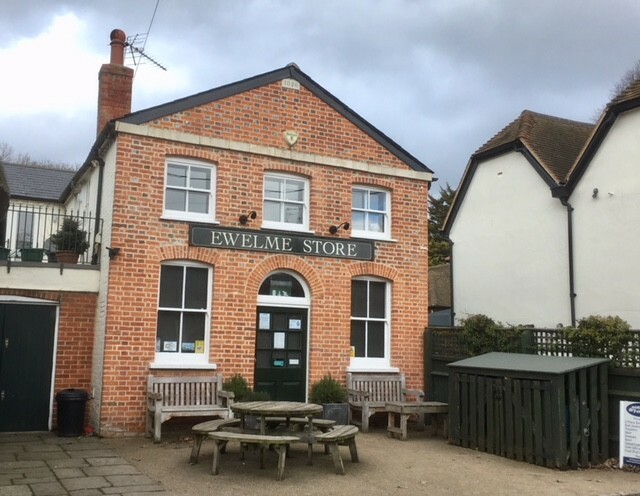 Perhaps not an obvious visitor attraction, Ewelme’s community run village store is well worth visiting. Primarily for its small cafe. It’s nothing fancy, simple rolls, soup and cake, but netherless it was busy on a Sunday morning with family groups and cyclists. The shop itself was packed with a variety of fresh food, household basics, local products and quirky gifts. It’s not surprising it won a best store in the south east award last year. Ewelme is famous for its watercress beds, which flow through the village for almost a mile. This was once a thriving business, producing watercress for over a hundred years before its closure in the 1980s. The beds became overgrown and the site derelict until villagers helped with their restoration and the Chiltern Society purchased the land. Nowadays the beds are run partly as a historical site and partly as a nature reserve, with open days and talks on the first Sunday of each month. 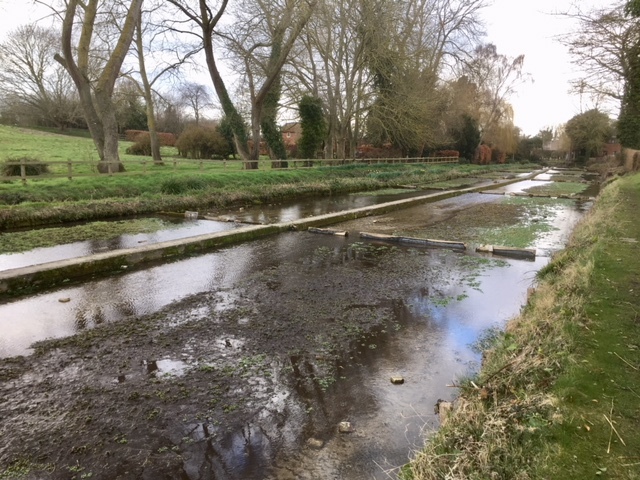 Although the watercress is no longer sold commercially (due to strict water regulations) the water looked crystal clear and the beds well maintained. Not that there was much watercress growing in March! From the watercress beds it’s a five minute walk, past the duck pond (another tick on my village requirements list), up a steep slope to the church and almshouses. 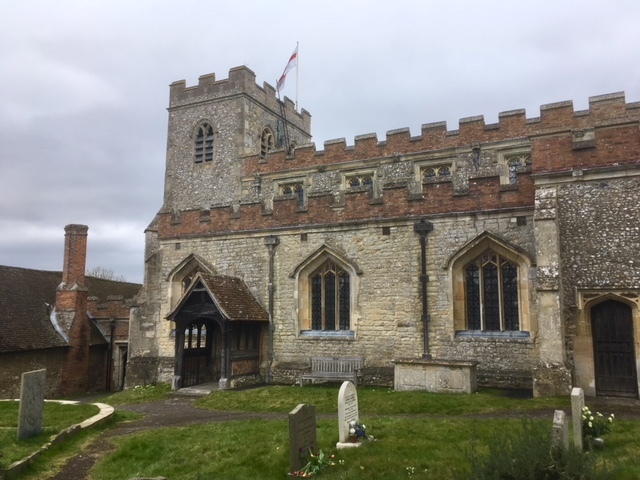 Inside the church are the tombs of Thomas Chaucer and Alice de la Pole, family of the poet and author Geoffrey Chaucer. I love reading but have never tackled his works; I fear I would be well out of my literary depth. Outside there are more literary connections. 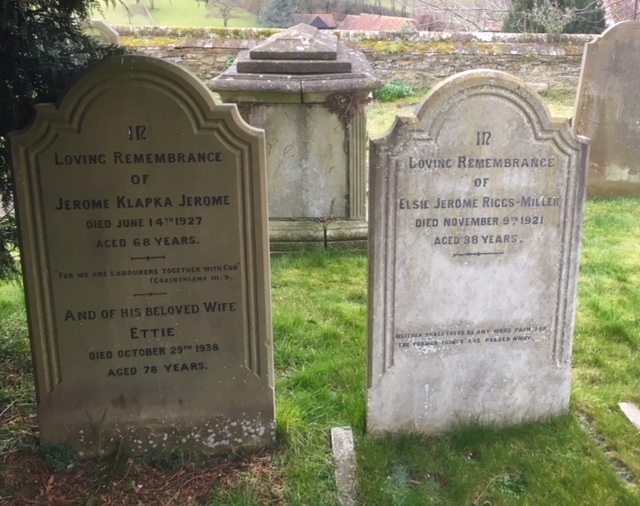 The graveyard is the final resting place of Jerome K. Jerome, author of Three Men in a Boat. I resorted to Wikipedia to find out more about him. An English writer and humourist he sounds like the Tony Hawks of the Victorian era (hope I’m not doing either a misjustice). And the K in his name stands for Klapka. What did we do before Wikipedia? Lastly, and most excitingly for me, the church was also used as a filming location for Les Miserables. Two hundred and fifty crew descended on the village for five days to film three sequences (in the mayor’s office, the tavern and home of the Bishop of Digne). I can only imagine the excitement that would have caused! From the church we walked back to the car park, passing the primary school. Built in 1487 it’s the oldest functioning maintained school in the country. The PTA runs Sunday afternoon teas in the school once a month between March and September. Between these, cake at the watercress bed open days and the village cafe I think my cake requirements would be met living in Ewelme! 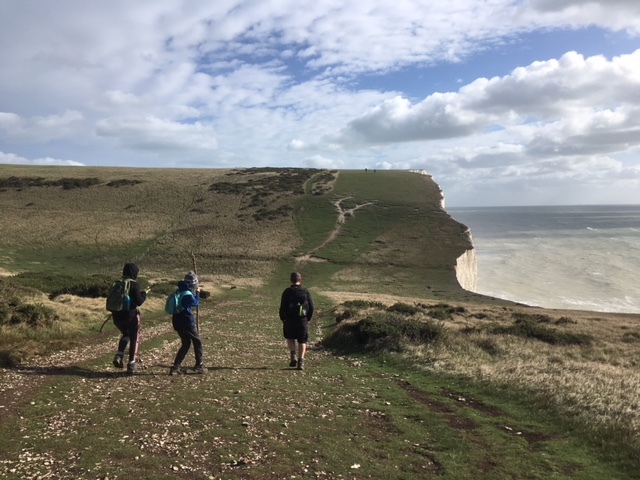 It’s taken me three months to write up the final section of our 100 mile South Downs Way walk. Perhaps I left it this long so that I forgot about the decidedly autumnal weather we encountered. In theory it was an easy 25 miles, split over three days, from Housedean Farm to the trail finish at Eastbourne. Rather than booking accommodation at either end of the route we based ourselves in a Premier Inn in Eastbourne. This gave us the opportunity to bribe the kids with big breakfasts each morning. Unlike its hip neighbour Brighton, Eastbourne has a genteel feel, particularly out of the summer season. 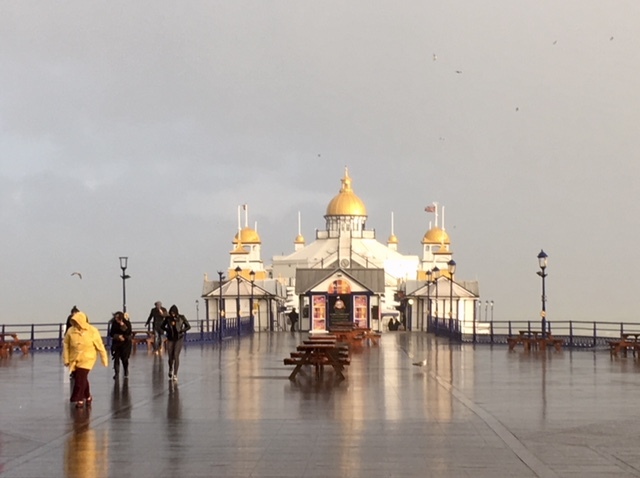 It was raining as we arrived but after a wet and windy wander around Eastbourne Pier and beach we discovered the great advantage of staying in a tourist town. Lots of different places to eat out! 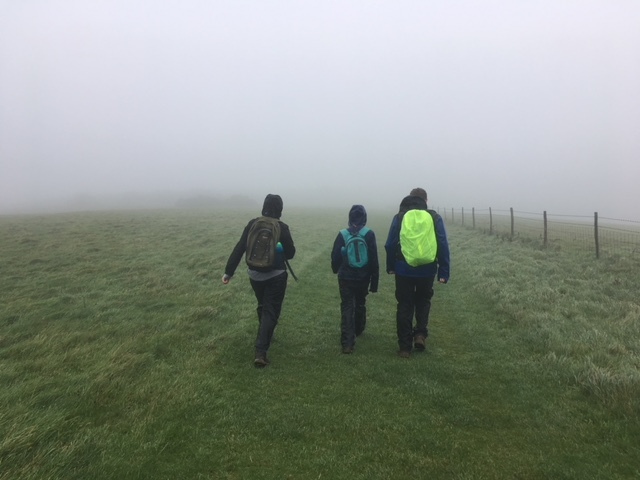 The forecast for the next day was dry and sunny with rain and mist the following days so I decided we’d walk the last, most picturesque stretch, of the South Downs Way first. 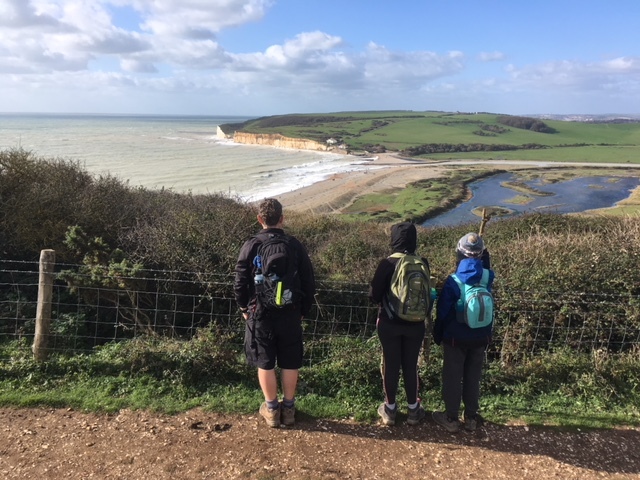 In some ways this was a great decision as we got to enjoy the fabulous coastal scenery between Alfriston and Eastbourne. On the flip side, it meant we finished our overall South Downs Way walk in horrible weather in Alfriston. A lovely village but not the grand finish I’d envisaged. At Alfriston the South Downs Way splits with an inland route for cyclists and horse riders, and a rollercoaster cliff top route for walkers. Whilst the inland route offers the impressive Long Man of Wilmington chalk figure there was no chance I’d miss out on the coastal walk. We set out from Alfriston following the river through the Cuckmere Valley towards Litlington. With the wind behind us and the sun shining it was perfect weather for a walk. Overhead we watched some late swallows who showed no signs of leaving for warmer climes. Despite missing out on the Long Man we spotted an alternative chalk figure, a white horse carved into a hill across the valley. We walked through the picture perfect hamlet of West Dean with its duck pond and laboured up 200 steps through Friston Forest. From here we descended to the Seven Sisters Country Park and our first cafe stop. 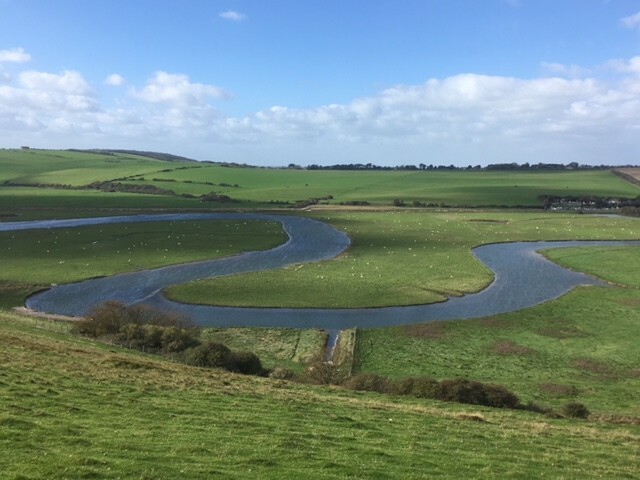 We’d arrived at Cuckmere Haven, a geography teacher’s idea of heaven with its meandering river and oxbow lakes. We’d visited with good friends several years ago and I even wrote about it in one of my earliest blog posts so despite its beauty we didn’t hang around longer than it took to drink a coffee. We ignored the flat path to the beach and headed up onto the cliffs. 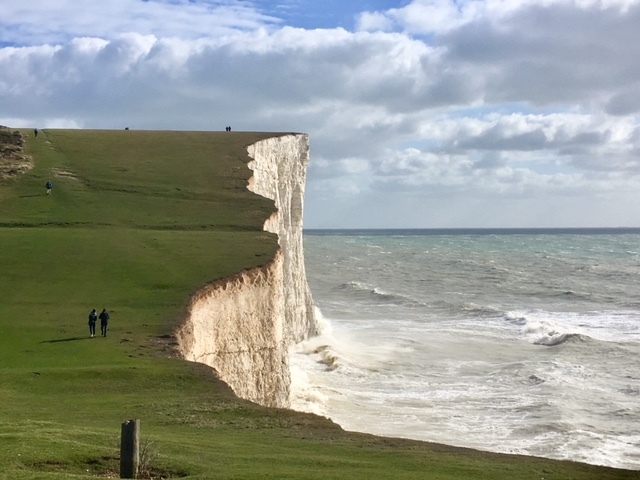 The Seven Sisters are a series of chalk cliffs, with peaks and dips between each. The walking was easier than I expected, undulating rather strenuous, although I did stop for a lot of photo breaks. It’s incredibly beautiful but all my photographs look identical – blue sea, white cliffs and green hills. As we neared Birling Gap a crane loomed beside the cliffs. 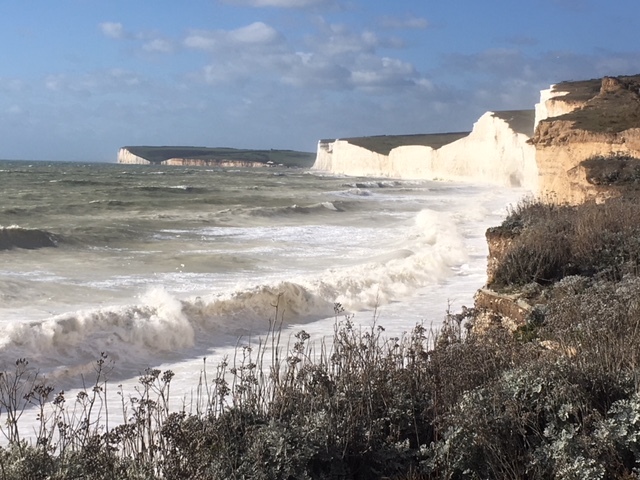 This section of coastline has suffered severe erosion over recent years, indeed thousands of tonnes of chalk collapsed last year between Cuckmere Haven and Birling Gap. The crane was helping to move beach access steps which have been affected by the erosion. Sadly there’s not much that can be done for the remaining coastguard cottages, which are slowly being lost to the sea. Birling Gap is on the tour bus circuit and we saw a lot of tourists on the cliffs either side. I watched in disbelief as one man crawled under a fenced off section of collapsing cliff to take photographs over the edge. There are plenty of signs around advising of the cliff dangers but they obviously didn’t apply to him. 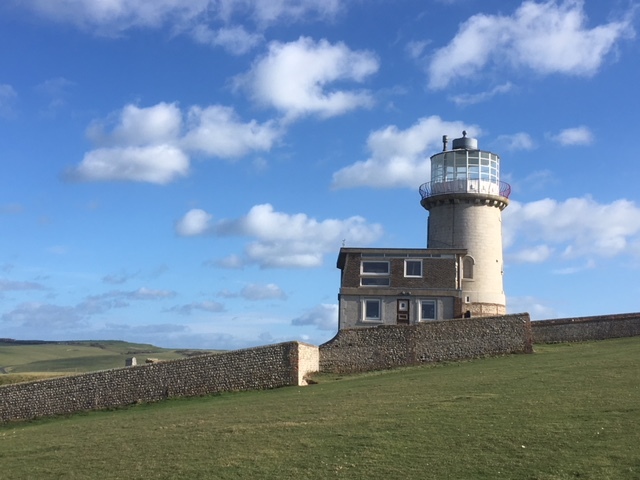 Our onward route took us past Belle Tout lighthouse. In 1999 this lighthouse was moved, with hydraulic jacks and concrete beams, 56 feet back from the cliff edge. I remember seeing it on TV at the time, what an incredible feat of engineering! That said, the lighthouse wasn’t good at being a lighthouse (too prone to fog) and after a variety of lives is now a bed and breakfast. Belle Tout was replaced by the better positioned Beachy Head lighthouse, although it was harder to see this from the cliffs. In 2013 it was the subject of a ‘Save the stripes’ campaign after Trinity House announced they could no longer afford to paint its red and white stripes and would be leaving the building to return to its natural stone colour. Campaigners successfully raised £27,000 and the lighthouse had its distinctive markings restored. 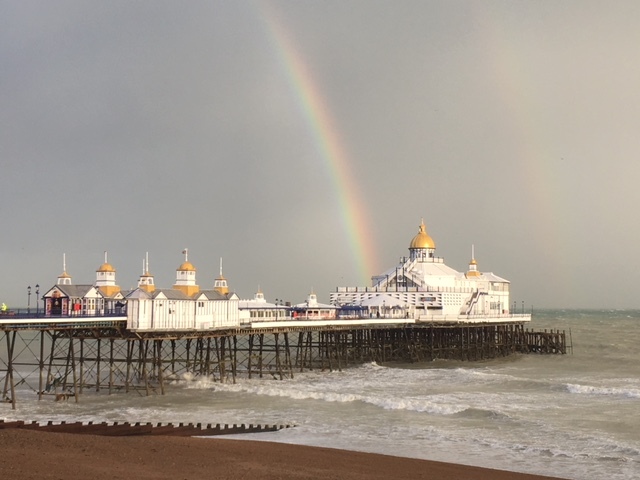 It’s not far from Beachy Head to the metropolis of Eastbourne. The South Downs Way route finishes at the bottom of a hill on the outskirts of Eastbourne. 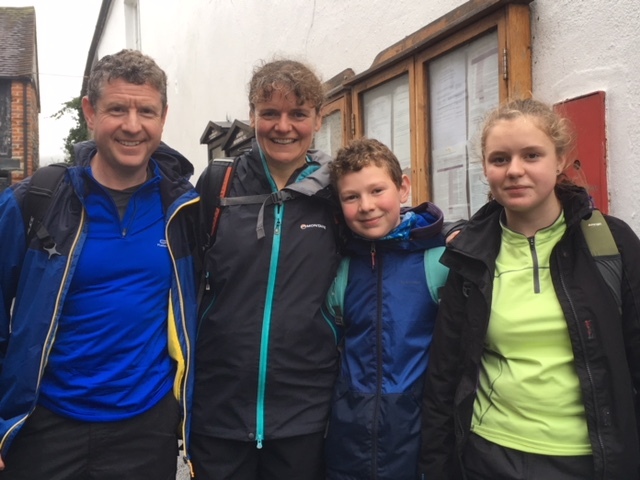 There’s an information board about the trail and a conveniently sited cafe but we decided to walk on into the town, pleased to have completed the walk in good time. The idea of walking over three days rather than two was that we could split one long day into two two shorter ones. Useful in case of inclement weather. After all, how wet can you get in an afternoon? The answer? Very, as we found out. With only a 7.5 mile walk planned for our second day we had plenty of time to spare. We ate a leisurely breakfast before driving to Southease railway station. The hourly train pulled in just as we arrived and we managed to jump on. Phew. It was only as we departed the station that we realised the train was going in the opposite direction to Lewes. Whoops! After an unplanned visit to Newhaven we eventually arrived in soggy Lewes. I hoped the rain would ease off in time for our walk but it showed no sign of abating so we ate a quick lunch and decided to head out. Boarding the bus towards Brighton we disembarked at Housedean Farm, where we’d finished after our walk from Truleigh Hill YHA. I can barely remember the walk. With our hoods up we focussed on the ground in front of us. It was wet, windy and misty. There were supposed to be views. I didn’t see any. I attempted a few photographs but my phone got wet and gave up on me. It didn’t want to be outside either. My memories from this walk? The time we stopped for a chocolate break, a large field of pumpkins and crossing the meridien line. That’s it. We perked up as we walked into Southease village. I’d parked in the YHA car park so it was only fair to give their cafe some custom. Despite being soaked the kids decided to stay outside and watch some cows being herded down the lane. I preferred to peel off my wet layers and drink coffee instead. The day had one last sting in the tail. In my haste to return to the hotel I didn’t stop at the multi storey car park entrance barrier. I drove straight through and knocked it down. I have no excuse, I literally didn’t see it. The kids thought it was hilarious. The car park attendant wasn’t at all amused. I was the second person that day to knock it off. I retreated to my room with my tail between my legs. The downside of staying in a Premier Inn is that there’s no drying room for wet gear. Our waterproofs (I use that word cynically) and wet clothing hung from every hook and item of furniture. The kids had even attempted to dry their boots with the hairdryer. 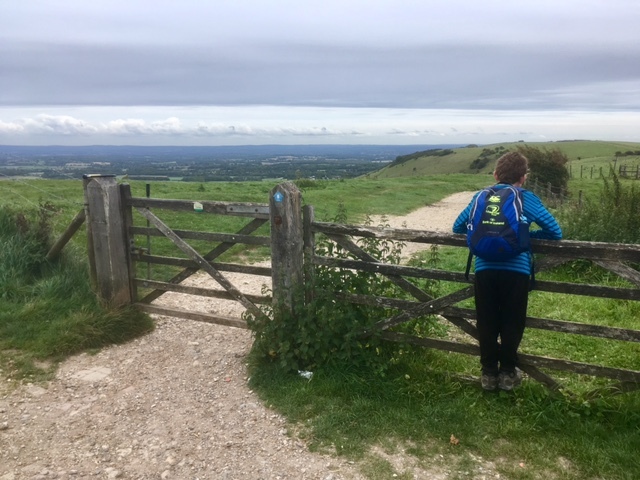 Still, it was our final day on the South Downs Way! Time to put on our walking gear for one last time. Returning to the car park I hoped to avoid the attendant I’d upset the previous day. As I stood at the pay machine looking for my ticket I realised I hadn’t collected one the previous day. After all, I’d driven straight through the barrier, no ticket required. Oh the shame. I had to return to the attendant’s office, remind him about my misdemeanour and ask to be let out of the car park. Unlike the previous day he now found it hilarious. As did my children. Three months on they still comment on every car park barrier we approach. We left our car at Berwick Railway Station and boarded the train back to Southease via Lewes. Fortunately the heavy rain had passed through but we were left with a misty drizzle and, at times, a fierce wind. As we headed up Itford Hill we discovered the over-riding theme for the day. Cows. There were cows in almost every field. 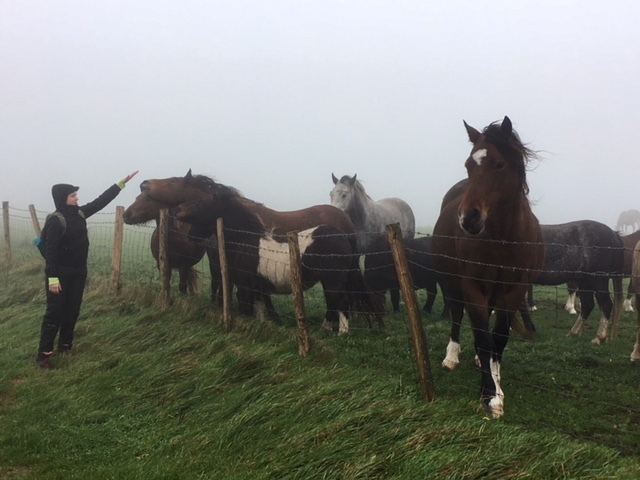 Huge beasts suddenly appearing in the mist on the path ahead of us. I’m not keen on cows but at least these were docile animals, more interested in grass than chasing walkers. 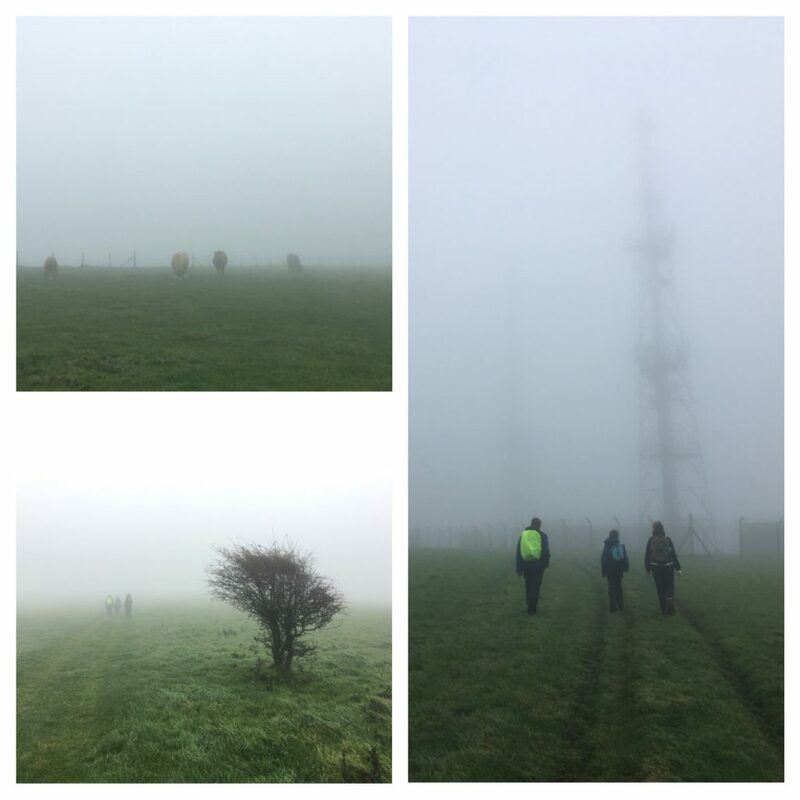 One benefit of the mist was that we didn’t see the radio masts on Beddingham Hill until we were almost next to them. I bet they stick out like a sore thumb on clear days. Annoyingly the mist also meant we missed out on views down to the Seven Sisters and Cuckmere Haven. Instead we had to content ourselves with guidebook descriptions of all the things we couldn’t see. On Bostall Hill we suddenly found ourselves buffeted by a strong wind. The kids had great fun being blown around with their jackets unzipped and arms up in the air like bats. Just before reaching Alfriston we passed a large field full of horses. I mean full. Maybe fifty horses and ponies. All of whom hoped we had something to eat. They were out of luck. Before long we were walking the final section of the track down into Alfriston. The end of our epic walk. I’m not sure what I expected. A congratulations banner strewn across the street? A welcoming party? Perhaps we should have told them we were coming. Instead we hung around the village centre for a while, hoping a bus would magically arrive and take us to our car at Berwick. It didn’t so we went for a celebratory cake and cream tea before walking back to our car at Berwick ready for the long drive home. The end of the South Downs Way! And there ends our South Downs Way walk! 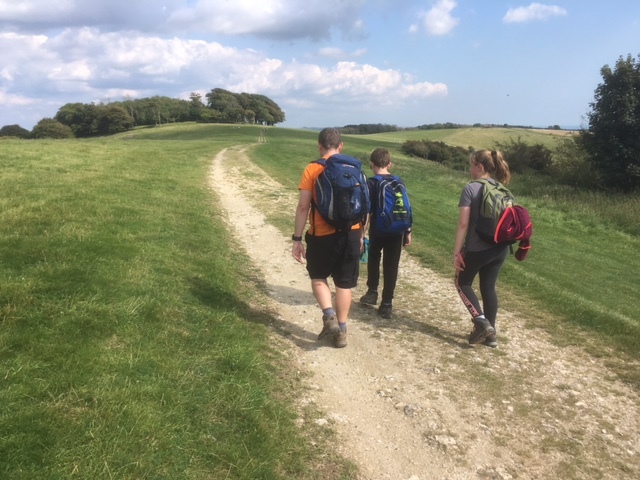 Click on the links to read my earlier sections from Winchester to Buriton, Buriton to Amberley and Amberley to Housedean Farm. The great thing about staying in Eastbourne has to be the evening meals out. Over the course of our stay we ate at Pomodoro e Mozarella, Toreros Tapas and Half Man Half Burger and I’d happily recommend them all. We stayed at the Town Centre Premier Inn in Eastbourne. You know exactly what you’re getting with a Premier Inn and this delivered it. Trains and buses. There’s a lot of public transport options along this part of the trail which was great for us. We made use of the stations at Berwick, Southease and Lewes, along with buses from Eastbourne and Lewes. 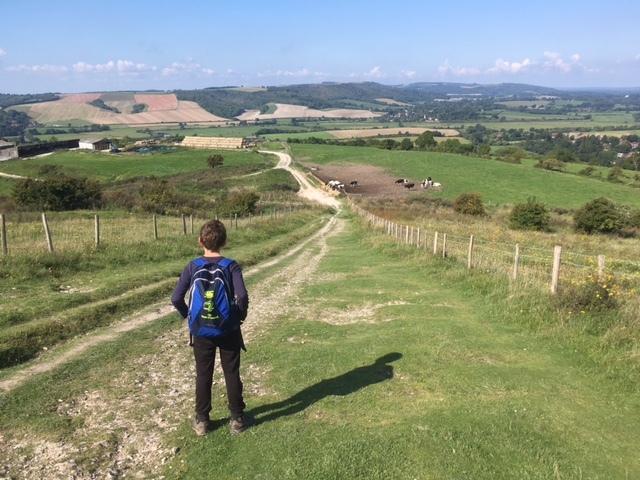 After a summer break we returned to walking the South Downs Way with the children. We’ve already completed the sections from Winchester to Buriton and from Buriton to Amberley. 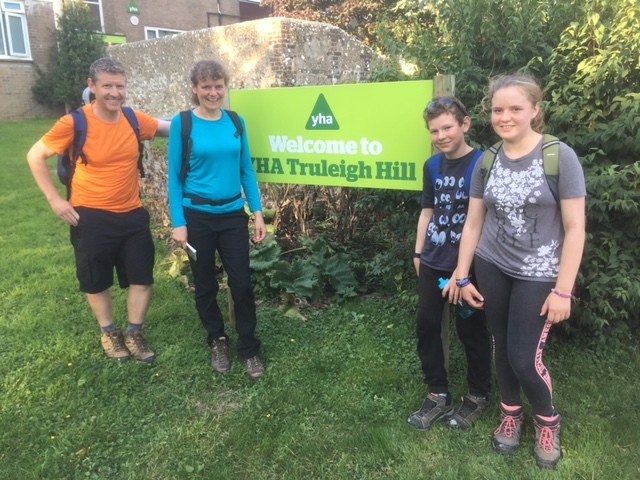 This time our walk took us from Amberley to near Lewes, with an overnight stop at Truleigh Hill YHA. As with our other South Downs weekends the logistics of linear walks take some organising. This time we had an early morning drive to Three Bridges railway station where we left the car for the weekend. From Three Bridges we took a half hour train ride to Amberley, our starting point. Unlike our previous visit the sun was shining and our feet and shoulders were fresh and ready for the walk. Amberley is evidently the prettiest village on the South Downs Way but it was too early in the morning to get distracted by tea rooms so we skirted the centre and headed steeply uphill to join the crest of the Downs. The path continued upwards, passing the fenced off trig point on Rackham Hill. A while later we decided to take the diversion which avoids crossing the busy A24 dual carriageway and enters Washington instead. Although longer it allowed us a quick drink in the pub and the chance to refill water bottles. 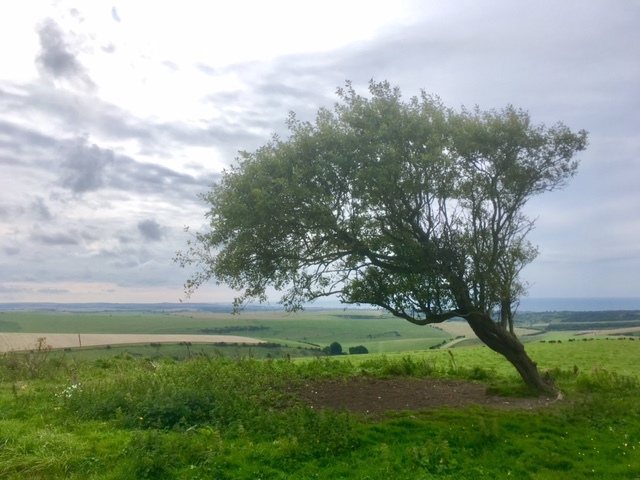 Suitably refreshed we climbed again up to Chanctonbury Ring whose beech trees mark the site of an Iron Age fort and a Roman temple. Sadly much depleted by the great storm of 1987 there are several legends connected to them. Did you know you can summon the devil by running anti-clockwise round the clump seven times? Or that women can increase their fertility by sleeping beneath the trees for a night. Needless to say we didn’t try either of these. 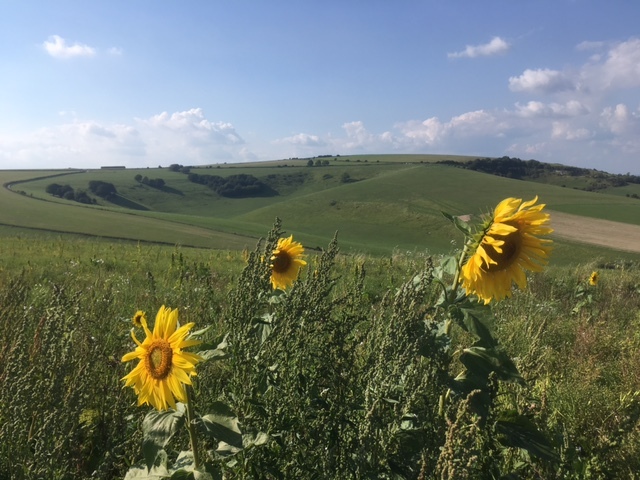 Onwards towards the amphitheatre of Steyning Bowl, nicely framed by a field punctuated with sunflowers. In the far distance we saw the radio masts on Truleigh Hill, reminding us how far we still had to walk that day. We were also treated to views of the derelict Shoreham cement works. There are grand plans afoot to convert the works into an eco or holiday village, depending on which report you read. Until then it’s a blot on the landscape. As we made our way down Annington Hill we were distracted by the sights and sounds of hundreds of pigs and piglets. Row after row of pigsties, full of sows lazing in the sun and piglets squeaking. We crossed the road and climbed Beeding Hill, our last hill of the day. We met a couple of cyclists heading in the same direction and rather embarrassingly passed them on foot. In their defence it was a steep hill and perhaps easier to walk than cycle up! The last mile or so was a long slog along the road to the Youth Hostel. Taunted by other guests arriving in their cars, and the cyclists overtaking us again. It was a relief to finally arrive at the YHA! This was the perfect location for our overnight stop. 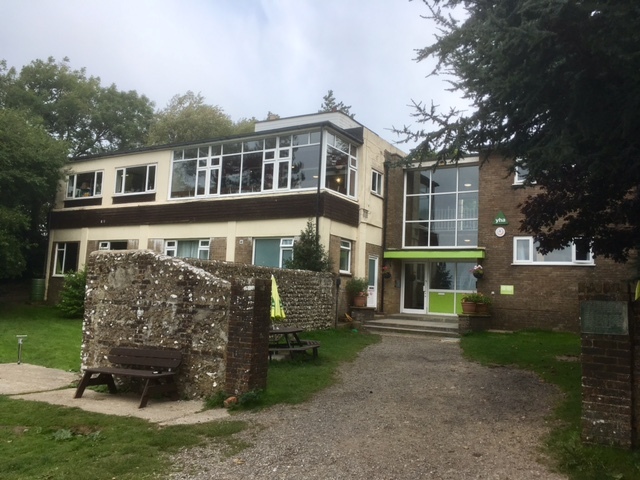 The building design was nothing to write home about but the hostel is right on the South Downs Way so no extra mileage required. After a short rest we were picked up by friends for an evening meal and discovered that even though a pub is a couple of miles away as the crow flies it’s a whole lot further when you need to use the roads! After a twenty minute drive, via Shoreham, we arrived at the pub and decided the menu wasn’t for us. Fortunately the pub in the next village was more promising and, surprisingly, had availability on a Saturday night. An excellent evening of catching up with old friends ensued. Back at the hostel we had a good night’s sleep and a reasonable breakfast. Although I do wish the YHA would stop offering powdered scrambled eggs at breakfast. Yuck. After a short walk we finally got to pass the radio towers which we’d seen from far away the previous day. The site is a former air defence radar station and underground there’s a nuclear bunker and tunnels. From the looks of the web it’s a favourite for urban explorers, which always sounds like an exciting, if slightly scary, hobby. Wonder which way the winds blows on the South Downs Way? 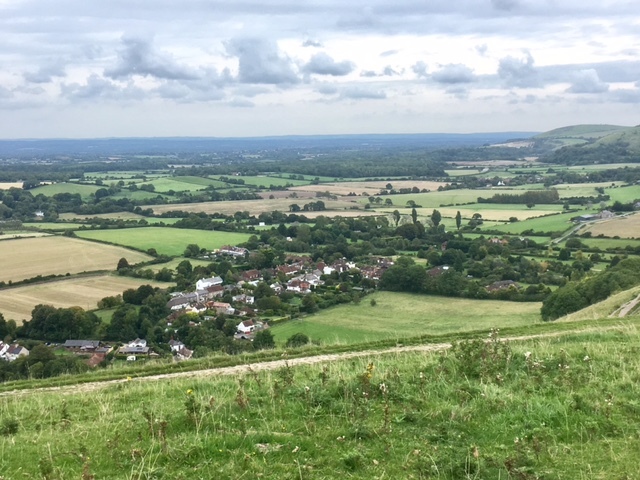 From the escarpment we were able to look down to Fulking and realise just how close the pub was to the South Downs Way. If you’re walking that is. Our route took in a couple of major attractions, the first being Devil’s Dyke. It’s a deep V shaped valley and, given its name, unsurprisingly home to more legends about the devil. It was a huge attraction for the Victorians with thousands of daily visitors at the peak of its popularity. After Devil’s Dyke we stopped for a drink at the WildFlour cafe. Located in a small walled garden at Saddlescombe Farm I was surprised to find that the current tenants of the farm had until recently farmed just a couple of miles away from our home. Small world. I had shown remarkable restraint at the cafe so whilst walking through the village of Pyecombe I bought some brownie treats from a street stall. We ate these whilst walking up through the golf course, keeping an eye open for stray golf balls. At Clayton there’s the chance to detour slightly off route to see the Jack and Jill windmills. Jack, a tower windmill, is privately owned and unusual because of it’s male name. Evidently windmills are usually given female names. 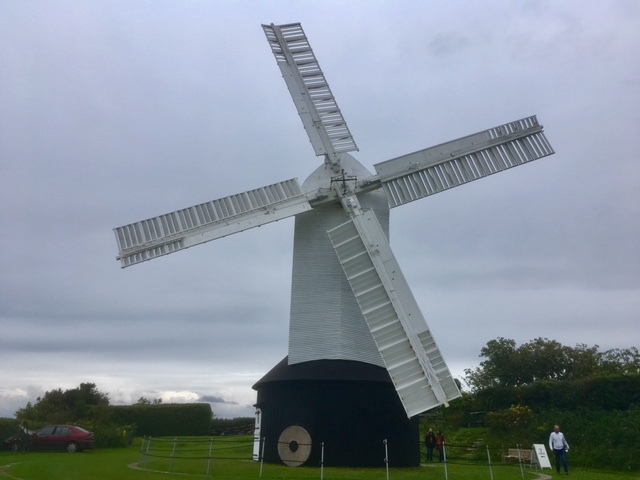 Jill windmill was another casualty of the Great Storm when she caught fire as a result of her sails moving whilst the brakes were applied. Fortunately members of the local Windmill Society came to the rescue. 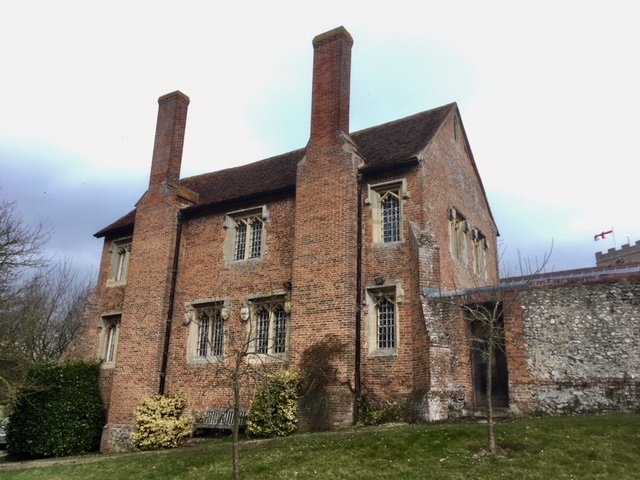 Nowadays, Jill is owned by Mid Sussex District Council and open to the public on summer Sunday afternoons (although it was also open when we visited in the morning). Visitors can buy stoneground flour, or just sit and enjoy the sound of the sails moving in the wind. Onto Ditchling Beacon, the highest point in East Sussex. It’s a popular destination, evidenced by the overflowing car park and ice cream van. There were plenty of cyclists too who had struggled up the steep road from Brighton. Rather them than me! The final part of the walk was a bit of a trudge into the drizzle. That type of rain that gets you wetter than you realise. 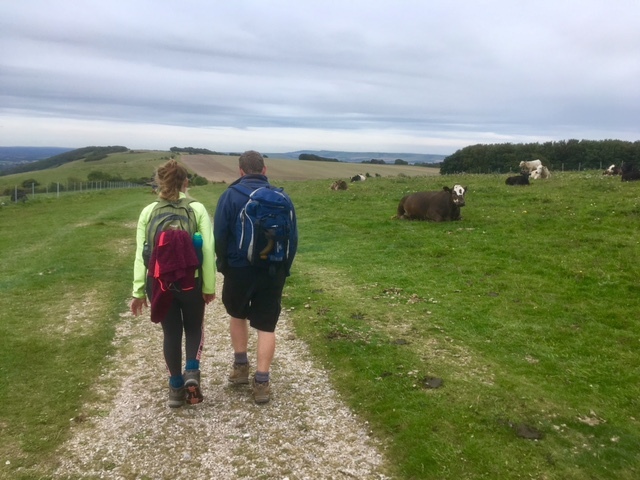 We quickened our pace to escape the rain, trotting through the woodland and down the steep hill to Housedean Farm, and the bus stop. 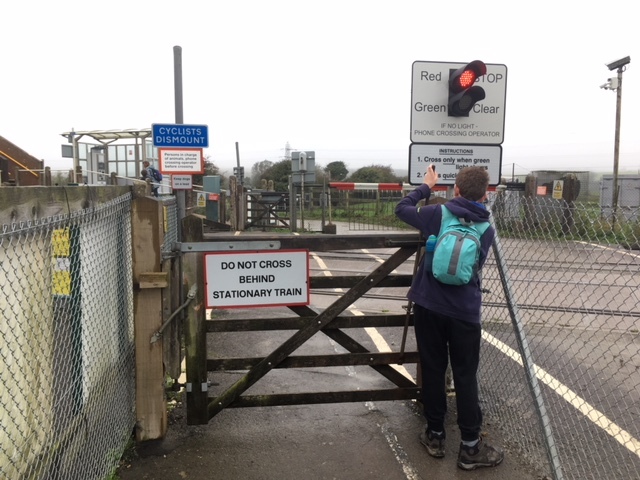 I was relieved to discover there were frequent buses on Sunday as I really didn’t fancy walking beside the busy A27 into Lewes. From Lewes we hopped on the train to Three Bridges, and returned to our car. Only 25 miles left of the South Downs Way! 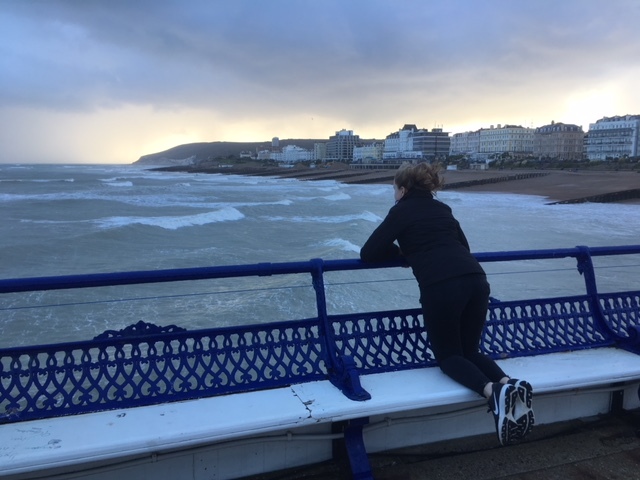 Fast forward and read about our final walk on the South Downs Way into Eastbourne. 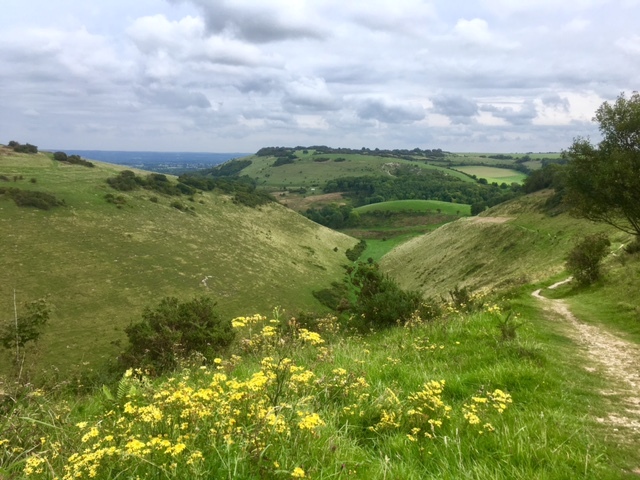 Visit the National Trails website for further information about walking the South Downs Way.